The most efficient hunting script on powerbot. OSHunter supports all the popular hunting methods of OSRS. NPC specific hunting strategies have been intelligently implemented to maximize hourly xp and money rates. 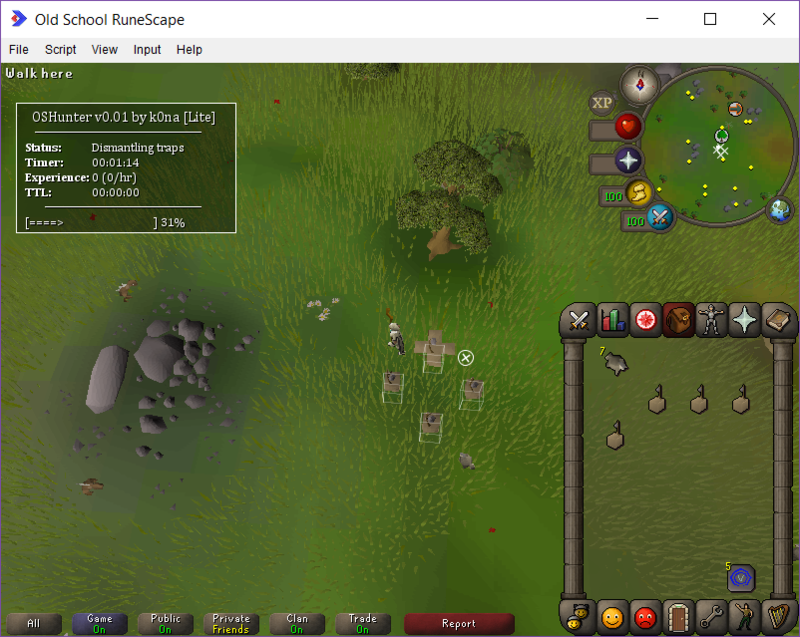 Load RuneScape in fixed mode (not resizable). Deposit/bank all items not strictly needed for hunting. Sign in and go to your desired hunting area before starting the script. Done! The script will attempt to automatically configure everything and prompt you if it needs help in doing so. Tbh if you're gonna work on the script if you can add red chins, also Black chins at the southeastern corner in the wildy with pker hopping enabled, and banking every 100-200. it would probably get premium instantly. Yes it does, I forgot to list them - my bad! Not on the SDN yet? Am interested to see how my script compares. No, unfortunately. The SDN does not seem to register any of the commits I have pushed to my repository. I've got shift-dropping enabled but it always right-clicks and drops unless I'm sitting here holding shift down on the keyboard? @k0na I've been using ur script and nom's script for red chins, and I gotta say yours seems like the better script. Your script prioritizes looting the chins and then reseting other things, and also yours switches it up between right click resetting and just check and laying. It seems less botlike, and your script in general reacts a bit quicker. Other than that Nom's script works better for exp per hour since his script prioritizes keeping as many open traps before looting. With Nom's I've lost maybe 3-6 chins every 5 minutes because it keeps trying to open up traps and not check the filled ones. I must be doing something wrong, having lots of issues. Restarted client already and also used my script successfully in the same session. The script will initially lay the traps fine, but then it only ever picks up one of the traps, leaving the rest to fall. Sometimes tries to add a 5th trap even though I don't have the level for it. Used the minimap to walk ~5 tiles once, I don't think you ever need the minimap to move when doing chins. I deliberately added some delays into my script, haven't tested as much with 5 traps, but I rarely lose chins with 4 traps. I saw profit per hour. Your script caught 159 chins in an hour and his caught 207. It's overall efficiency. I ran them at 80 hunter each. Same location almost same tiles. Good to have numbers for comparison. I personally don't like to run scripts that run at full efficiency the whole time, but I've reduced the delays. I still think prioritising number of traps laid should maximise chins caught since it increases the probability the next chin gets caught. If a trap is fallen or failed, it takes 1 action to set it up again from the ground. If it's caught a chin, it takes twice as many ticks to pick up then set down again. Cheers mate, glad to hear you're happy with it. Yes, you most likely are. For starters I would not recommend using resizable mode, it doesn't seem to bring anything but trouble when using RSBot. Opened script at Orange salamanders and it dropped "junk" (included waterskins) and then did nothing afterwards. Odd, that is definitely not the intended behavior. Will check it out when I get myself a bond. EDIT: IF using fairy rings to travel to a hunter area, the bot will attempt to drop the Dramen Staff if its in your inventory and not equipped. does this support black chins? and if so does it log or teleport when enemy is near? It does, yes. I am about to roll out a few more techniques that should greatly lower ban rates though. If I were you I wouldn't bot for a lot more than if I were playing by hand.